The Royal Liverpool Philharmonic has submitted a planning application to Liverpool City Council for its proposed £12 million refurbishment of the Grade II* listed Liverpool Philharmonic Hall in the heart of the city. Architects Caruso St. John has developed the designs for the 1939 concert hall, which include improvements to front of house areas and facilities for all visitors and participants including the foyer, box office, bars and catering, toilets and lift access to all levels of the building. There will also be rebuilding and improving of the stage and choir performance areas in the auditorium and a new warm-up, practice and backstage facilities for resident and visiting musicians and artists. Liverpool Philharmonic has been seeking to secure the necessary public investment for the refurbishment of the Hall, including a further £7.5 million investment from ACE. ACE will make a decision on Liverpool Philharmonics Stage Two application to its Capital Grants programme by June. 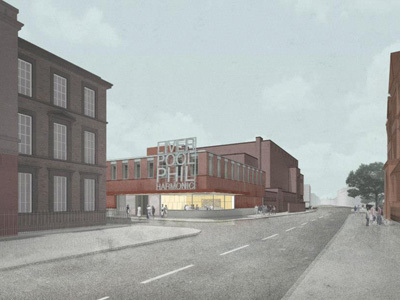 Subject to making a successful planning application and securing the required investment for the refurbishment, Liverpool Philharmonic will commence works to the Hall in Spring 2014, with the venue undergoing a period of closure until the end of October 2014.